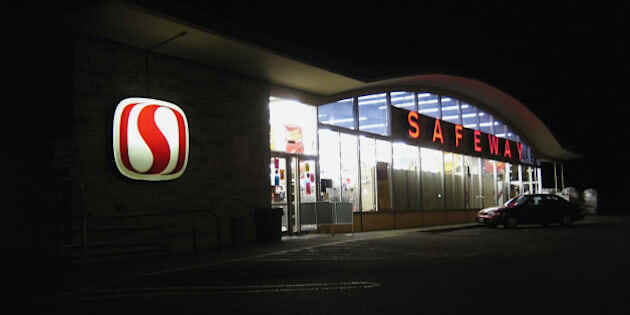 A classic Safeway store at 18221 Bothell Way NE in Bothell, Washington. The left side, with its 80s Safeway logo, appears to be the only change to the original design of this store--sometime in the early 80s they added a bakery. Calgary police are investigating after a man fell through the ceiling of the Whitehorn Safeway in the city's northeast Wednesday evening. Police told Metro Calgary a man managed to make his way into a crawlspace above the store's ceiling — an area that is not meant to withstand the weight of a grown human. “The man said he was being chased by other people and climbed up into the ceiling to get away,” Acting Det. Martin Taylor told The Calgary Herald. Police responded to the incident around 10:30 p.m., shortly before the store's closing. Police said they were unsure of the man's intent, but told The Herald they could not find the people the man claimed were chasing him. The man, who was unhurt after the fall, was taken into police custody. It is not known at this time if he will face charges.